I really love Marty Schwartz's teaching style and I'm delighted to review his Beginner Acoustic Easy Guitar Songs Volume 1, 2 and 3 DVD's. They are offered as a bundle set from GuitarJamz.com and it's a great way for beginners to learn how to play and create great sounding songs. As with the free material he has on YouTube, Marty continues to use his gift for teaching, talent, and humor on this terrific set of easy beginner songs! In this 3 DVD set, Marty has almost 4 hours of guitar instruction and covers a variety of different song styles and rhythms. All of the instruction is shown with an acoustic guitar, although almost all of the information is applicable to electric guitar players too. I received these DVD's as part of Marty's Guitar Coaching Club (which he will occasionally re-open for membership), and received all of his DVD's by mail. If you have been playing guitar for years, but have struggled to make significant improvement, then I think these DVD's will help you to gain more confidence. Marty shows you many of the popular open position chords (covering many different major, minor and 7th chords) and how to use these chords in popular progressions. It was really interesting (and motivating to me!) when I listened to these basic chords played in a different order with a different rhythms, and how they come together to create cool sounding songs. I could easily recognize, and learn to play, songs from Guns N Roses, Jack Johnson, Neil Young, the Indigo Girls and others famous musicians just by practicing along with Marty. He doesn't name specific songs he is covering, when you hear them, most likely it will sound instantly familiar. I love that you can rewind and practice along with these DVD's! Especially when it comes to strumming patterns, I find that I need to practice these over and over until it becomes automatic, and with this DVD set, Marty teaches some of the most common strumming patterns used in popular songs out there today. He calls out the down strums and up strums and gives you plenty of time to practice along with him. Sometimes, he will do the strumming pattern and then have you follow him, which I think is a very effective technique. As usual, Marty has a terrific sense of humor in this Easy Guitar Songs DVD set! I think he is one of the best guitar teachers out there and makes learning the guitar so much fun. I really enjoyed playing and learning with these DVD's. The only negative that I found from this 3 DVD set is that sometimes these discs did not immediately play on my computer. Eventually they all did play, but it was a little frustrating to put some of my DVD's into the computer multiple times before the main menu appeared. Other than that, I really enjoyed practicing along with Marty on these Beginner DVD's as well as learning new chord progressions and techniques. If you are new to guitar, or looking to improve your guitar skills, I think this is a great beginner package, chocked full of great information. Are you ready to learn some fun and easy beginner songs with Marty? Click here to order Marty's Beginner Acoustic Easy Guitar Songs 1, 2 and 3 DVD package! 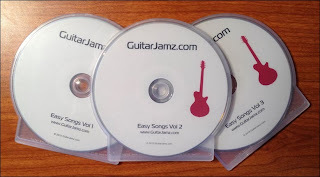 Disclosure: Please note that I use an affiliate link to GuitarJamz.com and I will earn a commission if you purchase these DVD's through my link (at no extra cost to you). My advice is to start with his free YouTube video lessons (there are hours and hours of free content here!). If you do decide to purchase Marty's material I would really appreciate it if you can click through this affiliate link. I TOO ORDERED THAT SAME SET YOU DID WITH THE LIFE TIME COACHING CLUB MEMBERSHIP, BUT I NEVER GOT THE MUSIC THEORY DVDS THAT WERE SUPPOSED TO COME WITH THE SET! Also I never get any other content sent directly to my email! I know about the great gaurentee but who or how do i get in touch with marty or whoever to get my missing dvds ? also i tried getting into coaching club a couple times & had trouble getting in there so i just said forget this! do you have a link or a way i can email this to marty ?